To mark World Sight Day 2017, IAPB is organizing the #MakeVisionCount Photo Competition for Professional and Amateur photographers to highlight eye health successes and document unmet need. Send us your photos with the theme ‘Make Vision Count’ before World Sight Day (12th October 2017). IAPB is back with the third edition of its World Sight Day photo competition organised with support from Bayer. World Sight Day is the most important event on the eye health calendar. To participate upload your photos on photocomp.iapb.org and share your photo link with friends on social media to collect votes. Winners will be announced on the IAPB website and the photo competition microsite on 16th October 2017. See photos from the #StrongerTogether Photo Competition held for World Sight Day 2016 and #EyeCareForAll Photo Competition held for World Sight Day 2015. This is the time of the year when we are transported around the world by looking at your photos. 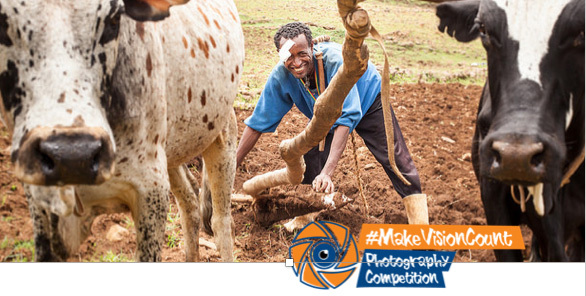 The #MakeVisionCount Photo Competition is to bring about awareness of eye care for World Sight Day. By participating in the competition you are helping spread the word. If you are an eye care practitioner, you can share your photos to show the conditions you are working on and the issues and successes you have experienced. This is only a list of ideas to get you started. Voting The photo with the highest vote will be declared the winner. Make sure that you are sharing the link of your photo in your social messages or emails and that your friends click on the link of the photo to vote for it. We are not counting likes or re posts / re tweet, re-sharing or hashtags. We will however like/re-share your post if you use the #MakeVisionCount hashtag. Upload your photos before World Sight Day, 12th October 2017 Winners will be announced on 16th October 2017 on the IAPB website. Winners will also be contacted by email. Plan to upload your photos at least a month in advance. This will give you time to collect votes from your friends and colleagues. Editors Picks The IAPB Editor’s Picks are to let you know that we think your picture is great. Every week, we select a few photos and give them a boost of 100 points to encourage you and get more votes for your photo and send us more wonderful submissions. We also share the Editor’s Picks on Facebook, Twitter and LinkedIn to give you extra visibility. Follow us to see the Editor’s Picks. The #MakeVisionCount Photo Competition is organised by IAPB (in partnership with Bayer) to bring awareness about World Sight Day (12th October 2017).